The lama temple in Beijing is a lamasery (like a monastery but for Lamas…no not the furry type with 4 legs but the enlightened Buddhist type). I was really looking forward to it as the Lonely Planet Guide said it was a good place to relax from the hustle and bustle of the city. I was disappointed though =( as the lamasery was really a relic with lots of people pushing and shoving to burn tons of sandalwood to Buddhist gods. I was hoping to get a good meditation in but there was nowhere to sit. No smiling, no peace and no connectedness. 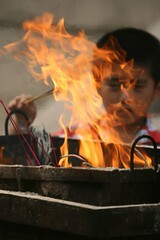 The incense was not smouldering but burning and the more incense you burnt the better your fortune would be it seemed. Sandalwood is a hardwood so seeing so much go up in smoke made me sad. Tried as I might I could not let go of my judgements so we left after having a good walk around.